The Papua Province has indeed become one of the priority areas for the installation of LTSHE, considering that there are still many villages that have not been electrified by PLN. The LTSHE installation program in Papua has been started since 2017 and continues in 2019. 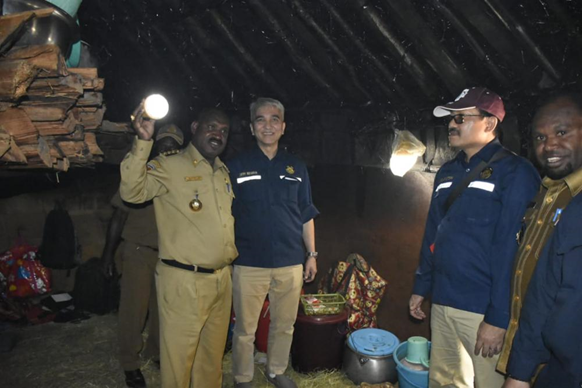 A total of 223,805 households have enjoyed lighting from LTSHE, which has been distributed since 2017 until 2018. As for 2019, the target of LTSHE will be installed in Papua that is as many as 12,531 which will be distributed in 8 regencies, which reach 151 villages. 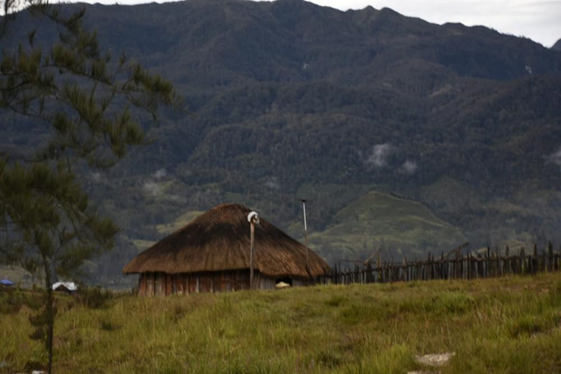 Specifically in Papua Peak District, there were 18,102 units of LTSHE during the year of 2018 spread over 10 District areas, covering 86 villages. The District that received the LTSHE distribution was Agandugume (7 villages, 701 households), Beoga (8 villages, 2,295 households), Doufo (7 villages, 553 households), Gome (7 villages, 3,182 families), Ilaga (9 villages, 1,526 families) ), North Ilaga (4 villages, 1,459 families), Omukia (14 villages, 1,322 households), Pogoma (9 villages, 1,785 households), Sinak (10 villages, 3,273 households) and Wangbe (11 villages, 2,006 households). These shared lights have a 3-year warranty until 2021 and if there is damage, they can be taken to a service center located in Timika. 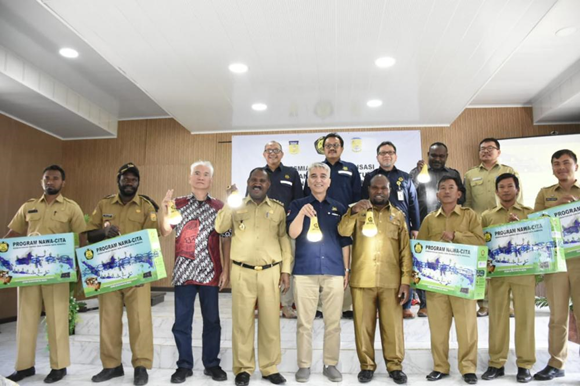 Not only LTSHE, Papua Province also received an allocation of 600 points of Public Street Lighting -Solar Power (PJU-TS), specifically Puncak Regency was allocated at 300 points. PJU-TS is a street lighting lamp that uses sunlight as a source of electrical energy, so it becomes a solution to be used on roads in areas that have not been reached by PLN electricity. Ilaga District, located in Puncak Regency, is one of the Districts located in the mountainous area and access to the District must use pioneer aircraft. A representative of the ESDM Ministry who was present in attendance at Ilaga to symbolically hand over LTSHE to Puncak Regency, took a difficult and challenging journey to arrive at Ilaga District. The team boarded a pioneering caravan type aircraft with a capacity of only 15 passengers, departing from Mosez Kilangin International Airport, Timika, Papua to Ilaga Airport, which takes around 45 minutes by crossing a stretch of high valleys and mountains. The intense cold was felt when in Ilaga because the area was adjacent to the Cartenz Peak which became the highest mountain peak in Indonesia. The ESDM Ministry Team Leader led by Expert Staff of the Minister of Energy and Mineral Resources in the Field of Environment and Spatial Planning, Satry Nugraha, praised the beauty of Puncak Regency . In his remarks, Satry conveyed, the Government was very concerned about the condition of Papua. Therefore the installation of LTSHE in Papua has been started since 2017 and still continues until 2019. "The LTSHE budget in 2018 reached IDR 558 billion with the number of LTSHE of 172 thousand units. Including 152 thousand units allocated for Papua Province. Gome District was the one with the most LTSHE with 3,182 units, while Doufa District was the least with 553 units. "Well, for Ilaga to get 1,526 units," said Satry. The benefits of LTSHE are quite a lot. Besides being able to be used as everyday lighting, LTSHE is also useful to support activities even at night. "Our hope is of course that it can be used for students who want to repeat the lesson at night. Hopefully the community will be greatly helped by the installation of this LTSHE," he continued. Satry did not forget to express his gratitude and appreciation for the cooperation and support of the Peak District and Papua Governments who tried their best to illuminate their citizens. He also reminded the community and the local government to maintain the LTSHE so that the benefits could be felt by the community for a long time.